They decided that March 20 would be the day of francophony worldwide. In December 1993, Bulgaria joined this worldwide organisation, which currently unites 54 countries. * After the 1876 April uprising, the Turkish atrocities made the world turn its voice in defence of the Bulgarian people. Prominent statesmen, political and public figures, intellectuals and scholars to whom the Bulgarians would always be indebted, joined in a campaign for the Bulgarians' right to lead free life. The name of the French writer Victor Hugo stands out in this list. 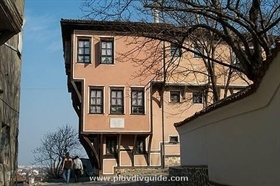 * In 1838, another famous French writer A. de Lamartine, visited Plovdiv. He spent some time in the house of Georgi Mavridi. Currently, this house operates as a museum known as the Lamartine house. Various items related to the life of the French poet and politician are stored and exhibited in the museum. * The first Bulgarian post stamps in 1879 were evalued in francs (because Bulgaria has not have her own currency). * The first dirigible flight in Bulgaria took place near Plovdiv. It had a French-Bulgarian crew. * France helped Bulgaria to create its fleet in the Black Sea.